Slow progress is better than no progress, right? My string block picnic quilt is finally coming along. Right now it's about 60x60, but I just decided to add another couple of rows. So I'm back to the block-creation step. I think I'm about ready to work on something other than red, green & black. So lovely. 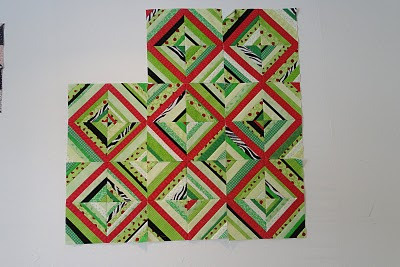 A string quilt has been on my to do list for some time now. Seeing yours it just makes me want to make one even more!